Driven athlete ready to do whatever it takes to succeed. This is the best way to describe Deja, our Client Services Associate. Deja is a basketball player turned coach with a passion for seeing others grow and develop in life. You could say she was born for her position in financial planning; she has the heart of a true coach that compels her to help others reach their potential. 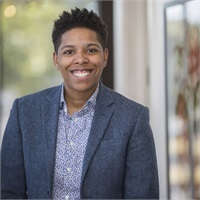 In her role at Fish & Associates Deja effectively handles client operations and day-to-day account management tasks like transferring funds or making adjustments to keep clients on track as they chase their goals. No job is too big or small for her! She’ll tackle it with a tenacity and commitment to your success. Born and raised in Memphis, Deja is currently pursuing a Master’s in Financial Planning and Counseling from the University of Alabama. She cares deeply about the community, and is the Financial Literacy and Empowerment Chair for the Memphis Urban League Young Professionals Chapter. Perhaps we could all learn something from Deja. She seems to have mastered the art of balance: she’s passionate about her professional life and excellence in her studies, but also manages to make time to give back to the community and stay involved with her family. She plays basketball often, and enjoys spending time with her young niece.